What the hell is that? Scientists ask this question every day when trying to work out how different living things are related to each other. The answers aren’t easy or trivial. Biological affiliations are used not just to build a catalogue of life but also to understand how life has evolved into its many forms. Viruses are an excellent example. They pose a problem for biologists because they don’t have cells and so don’t fall into any of the main three groups or “domains” of life that all other organisms do – bacteria, archaea (a different form of microbe) and eukaryota (plants, animals and fungi, among others). Some scientists argue that viruses don’t count as living organisms and are better seen as rogue genetic material that can’t reproduce on their own and need to hijack host cells. Others believe viruses evolved from cellular organisms and so count as a fourth domain of life. The latter theory was boosted by the discovery a decade ago of giant viruses that are more similar to cellular lifeforms. But a new study, published in the journal Science, on the genomes of these giant viruses calls this idea into question. So will scientists have to start their search for the origins of viruses all over again? 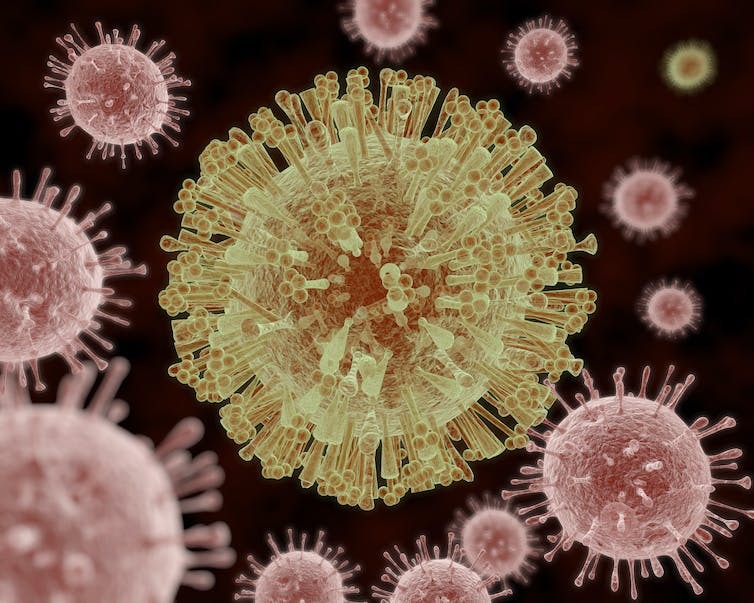 Viruses are tiny, minimalistic beings that get away from the nuances of cellular life. They are usually composed of genetic material (DNA or its molecular cousin RNA), often surrounded by a protein coat called a capsid, sometimes with additional layers borrowed from a host cell. 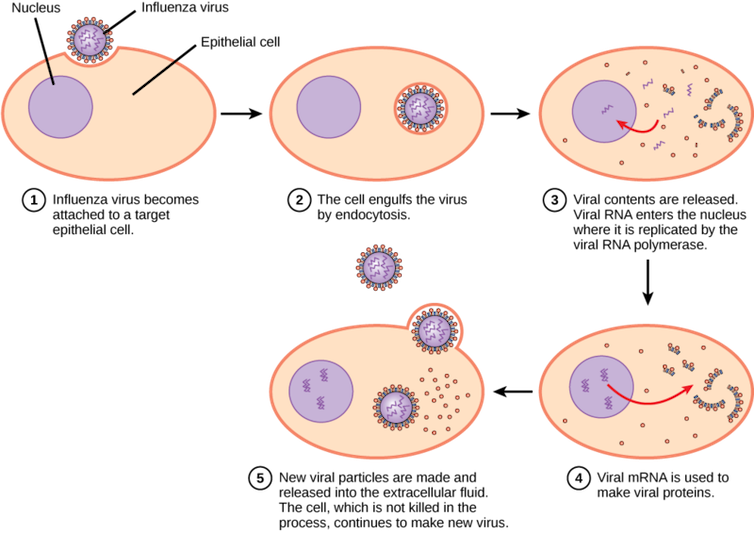 Viruses can only replicate within a host cell by hacking its metabolism, and each domain of life is infected by different versions of these cellular squatters. This tremendous dependence on host cells push them to the limits of the definition of life, with some considering them alive and others dead. It is no wonder that most zombie stories involve a virus. Maybe it would be just easier to consider viruses undead. The big question is: where do they come from? Competing theories try to explain how viruses evolved. One portrays viruses as descendants of an ancient lineage of cellular organisms that lived within other cells and simplified their structure over time. This would make them the only survivors of a long-lost fourth domain of life that left the cell organisation behind. If viruses evolved from living organisms, it would make sense to think of them as alive now. Another theory proposes that viruses started as rogue genetic agents, vagrants in the genome that escaped their cellular confinement. They could be related to jumping genes that can copy or cut themselves from a genome and then paste themselves into other parts of the DNA. In that case, viruses would be the result of molecular accidents that became evolutionary stable. This would mean they have never been complete living organisms, just as a computer virus is not a complete computer. Both these proposals have their flaws. The first fails to explain how simple viruses are. There are no other known organisms with that extreme degree of simplification. On the other hand, the second theory doesn’t explain why viruses are so much more complex than other mobile genetic elements, none of which have anything comparable to a capsid coat. Then, in 2004, scientists discovered a kind of giant virus (or “girus”) that seemed to tip the balance in favour of viruses having cellular origins. They are called giant for good reason. Some are ten times larger in both size and genome length than our beloved flu virus, and have as many 2,500 genes compared to influenza’s meagre 11. This additional genetic material includes instructions for making proteins, something sorely lacking in other viruses but present in all other lifeforms. The molecular system is not complete and giruses still need to invade cells to make more giruses. But some researchers suggested that these genes could be leftovers of a cellular past, backing up the existence of a fourth domain of life. On the other hand, the jumpy genetic nature of viruses makes them prone to take genes from other organisms. This has prompted others to argue that all these additional genes in giruses are products of evolutionary thievery. Now a new study has confirmed the “borrowed” nature of all these genes in viruses. The research uses the most advanced methods, named Next Generation Sequencing (NGS), to map out DNA extracted from a wastewater treatment plant in Klosterneuburg, Austria. In the last few years, NGS-based studies have uncovered myriad new types of lifeform, and in this instance NGS has revealed a completely new lineage of giant viruses, the Klosneuviruses. Among all giruses, Klosneuviruses have the largest set of genes involved in making proteins. By comparing the genomes of different giant viruses and carefully reconstructing their evolution, the researchers persuasively show that the protein-making machinery in these giruses is a relatively recent genetic addition – not the scraps of a larger ancestral genome. The study argues that the host cells these viruses tried to hijack may have evolved a defence strategy based on hiding proteins from the invaders. Then the viruses adapted by incorporating some of these genes into their genome. The researchers conclude that the giant viruses analysed in this study have evolved multiple times from smaller viruses, rejecting the idea they evolved from cellular lifeforms.